In some shadowy ‘70’s corner of my childhood memory there lurks a regional charm bracelet craze. While jewelry has never been an obsession for me, I’ve forever been smitten with little things (yes, especially you, My Little Fur Child), and the minute, tinkling replicas were transport to a tiny imagined world. Memory being fuzzy around the edges, as pieces of childhood are wont to be, I’m not sure who in my family had one of these mobile collections. But I recall a sense of sitting close to someone older who allowed me to carefully, charm by charm, examine each miniature, sliding the bracelet along their wrist to bring the next small wonder into place for consideration. I think charm bracelets will always revolve back into fashion, sometimes in alternate forms. Just last weekend a friend explained the significance of each detailed bead charm on her bracelet, recalling family milestones and relationships. Thankfully, the best kinds of nostalgia never go out of style. 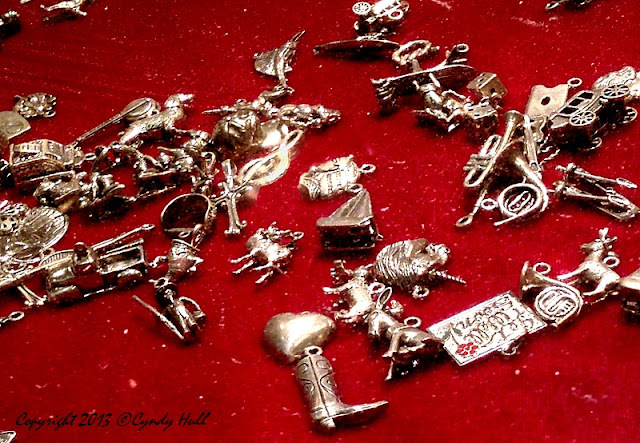 Charm bracelets are an were - well - charming! I think I was the sister with the 'world on her wrist'. Wonder where it ended up - maybe in one of my boxes of memorabilia.